a good idea for any age! to obtain 1 kg of Grana Padano cheese you need 15 litres of milk. To obtain 1 kg of GROKSÌ! Deciso you need 1.7 kg of Grana Padano cheese (25 litres of milk). one 15 g pack of GROKSÌ! amounts to the same nutrition value as 375 ml of milk and only has 75 Kcal. 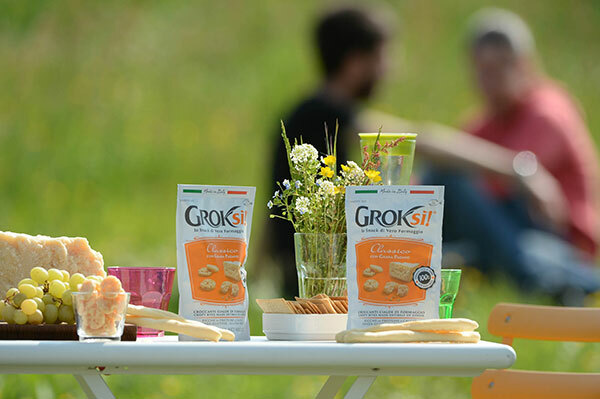 one 15 g pack of GROKSÌ! provides 31% of the daily requirements of Calcium and 24% of the daily requirements of Phosphorus for an adult. one 15 g pack of GROKSÌ! provides 14% of the daily requirements of Proteins for an adult. the Protein in GROKSÌ! is milk protein. GROKSÌ! is gluten and lactose free and is delicious!